A Note to Our Supporters About Electronic Communications: In years past, we have mailed "hard copies" of Dame Daphne's annual appeal. Because of the growth of our mailing list, we have shifted to e-mails. The money saved will help fund the Trust's projects.Please click here for an Adobe PDF copy of this letter. With another year drawing to a close, we again must thank all the supporters in the U.S. and Canada for enabling us in Kenya to continue to make a significant difference during 2009, which has been the most challenging year we have ever had to face. However, before all else, importantly, we must first wish all our supporters in North America a Very Joyous Christmas and a Happy, Peaceful and more prosperous 2010. I remember saying that most would be happy to see the end of 2008, but 2008 pales in comparison to the challenges that have confronted us in 2009. Not only has the entire country been gripped by the most prolonged and severe drought in living memory, but there has also been a marked escalation in poaching, fueled by the rising demand for ivory in the Far East, particularly in Thailand and China. China is the largest consumer of both legal and illegal ivory where the price now stands at over US $1,250 per kilo. 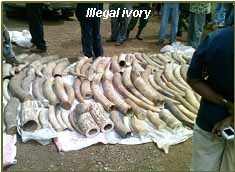 Moreover, locally the price paid to a poacher for an illegal tusk has risen from K. Shs. 300/- to K. Shs. 5,000/- per kilo, encouraging poaching for profit, particularly in countries where there is corruption and mass unemployment. Chinese construction workers are now in Kenya in numbers, working on roads in the country and during the year several Chinese nationals have been apprehended at Jomo Kenyatta International Airport trying to smuggle out illegal ivory. The population of China is becoming wealthier, and almost everyone aspires to an ivory hanko or name seal (name stamps carrying the personal seal of the owner are used in lieu of signatures for documents). The poaching of the rhino has also risen sharply in this country during 2009. 2010 will be a watershed year for elephants because parties to The Convention on International Trade in Endangered Species ("CITES") meet again in March, faced with proposals from Tanzania to downgrade its elephant population from the fully protected "Endangered" category to merely "Threatened." This initiative was undertaken despite a marked increase in poaching in Tanzania, particularly in the famous Selous Game Reserve where 50 elephants are reported to be dying each month, some at the hands of the people who are paid to protect them. Large illegal ivory hauls, proved through DNA testing to have originated in Tanzania, have been regularly intercepted during 2009, so the decision taken by CITES next year will spell either life or death for Africa's East African elephants. It is predicted that, should a full ivory ban not be reinstated, elephants throughout Central and East Africa could face extinction within the next 15 years. Aside from poaching for ivory and rhino horn and bushmeat, all animals, both domestic and wild, have suffered terribly from the severe drought that gripped the country during 2009, exacerbated by hordes of starving domestic livestock being illegally driven into the National Parks. These herds have depleted the grass reserves upon which wild animals rely during the long dry seasons. As a result, drought has taken a heavier toll than ever on all wild species this year. During the 32 years that the Trust has been rescuing and saving orphaned infant elephants, 14 is the most we have ever had in our Nairobi Nursery at one time. We have had to accommodate as many as 30, the lucky few rescued. 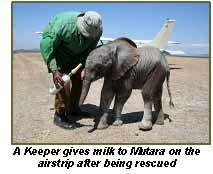 Many others, particularly those who are still milk dependent, (bearing in mind that elephants cannot survive without milk under three years of age), have been lost, their mothers lacking the lactating capacity to sustain them during the long distance trek in search of both water and fodder. Whilst 24 infant elephants are still with us in the Nursery, this is after having hurriedly moved nine of the older Nursery elephants to the Voi Rehabilitation facility in Southern Tsavo and after 28 others have died soon after rescue, having come in already too far gone to save. Every rescue entails the cost of an aircraft to collect an orphan from distant corners of the country, more often than not already in a state of collapse, which entails the insertion of life supporting intravenous drips during the flight to keep them alive until arrival. Thereafter, extensive care is vital to try and save emaciated, grief-stricken and psychologically devastated infants who are, by nature, fragile at the best of times but who must adjust to artificial formula milk and the loss of their natural family. Milk and drugs have to be purchased and additional sleeping space made available to accommodate the influx of newcomers. Existing stables and stockades have had to be partitioned, the orphans doubled up, and new stables hurriedly constructed. More Keepers have had to be recruited and trained, all of which entails a considerable expense that we did not anticipate. Many people question the logic of saving the orphans in the face of so much bad news surrounding elephants, but every elephant is precious. It has now been scientifically proven through a study of the elephant brain that elephants are indeed "human" in terms of emotion, sophisticated intelligence, a superior memory to that of humankind, and many other attributes we lack. They are an integral part of the wild ecosystem, upon whom almost all other species rely for survival; simply put, a world without them doesn't bear contemplating. The orphaned elephants have helped promote understanding of these magnificent animals which includes educating the local people to their value in terms of tourism. Throughout 2009, urgent water issues have confronted us. As rivers ran dry, water levels fell in existing boreholes and windmills struggled to bring up the ground water upon which all life, both human and wildlife, rely. It is the Trust that has had to meet this emergency in Tsavo. The one existing borehole at Ithumba (which serves 30 orphans in the process of rehabilitation and all their wild friends) faltered. Steps have been taken to drill another and we had to purchase two water tanker trucks to haul water in from afar to avert a crisis both at Ithumba and on Trust land abutting the river Athi. There we have fed and watered the resident pod of hippos to keep them alive until the river flows again and rain regenerates the land. Each and every day this year brought a new set of challenges and it is with deep pride that I can report positive results. Hundreds of wild lives have been saved and this has surely been worth both the effort and expense. In these difficult times, each of us can only do what one can. The good news is that thanks to the help of caring people, the Trust has now been able to save a Sizeable herd of elephants - a herd that now numbers over 120 with ex Nursery elephants beginning to produce their first wild-born young, and sharing their joy with the Keepers who steered them into adulthood, and returned them back to nature when grown. Now that 2009 is about to end, we are left wondering what will be in store for us in 2010. On the one hand, heavy El Nino rains are predicted and we pray that they actually materialize to heal the land. On the other hand, Global Warming predicts a hotter, drier African continent. 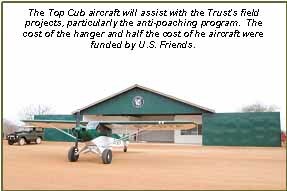 Good news is that our new Top Cub aircraft is now operational, empowering us to be more vigilant of poachers from the skies above Tsavo. The Trust has been given a mandate to protect a very important area of forest abutting the Chyulu Hills National Park, which is home to many indigenous species, and within which is a crucial and very important spring - the only source of ground water for all wildlife within the Chyulu National Park. The construction of another Ithumba style Self Help camp is under way, thanks to a generous legacy left by a kind deceased donor. This will generate proceeds that will help protect the forest. Hence, apart from the difficulties of 2009, there is good news as well. We end this letter with an appeal that all our Friends will not lose heart, but will consider providing their generous support, focusing this year on the Orphans' Project. Due to the dramatic and continual influx of infant elephants in our care (currently 30 in the nursery), and not forgetting that they will be our responsibility until at least the age of l0, U.S. Friends' goal is to raise $150,000.00 to help us on the Orphans' Project. Contingency assistance to wild animals in need will also have to continue, for they will become the innocent victims of global warming who will need help until nature can adjust to a changing climate. We pray that the generosity of all our donors will not wane and that we will be able to count upon it during the coming year. And we also pray that CITES will, on this occasion, consider the elephants rather than just trade, and make the right decision to protect them, irrespective of the greed of those who selfishly regard them as a mere commodity. We are deeply grateful for your support and we hope you will consider us in your year-end giving. We are a charity organized under the Indiana Non-Profit Corporation Act and have been recognized by the Internal Revenue Service as a tax exempt "public charity" under Section 501(c)(3) of the Internal Revenue Code. Contributions to U.S. Friends are deductible to the extent provided by the Internal Revenue Code. 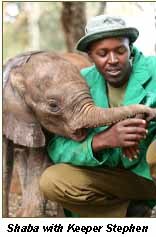 Our mission is to provide financial and technical support for all the programs of The David Sheldrick Wildlife Trust and ensure donated funds go directly to support the Trust. 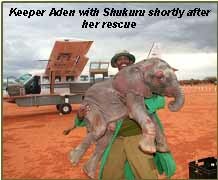 The David Sheldrick Wildlife Trust 2009 newsletter will be posted on www.sheldrickwildlifetrust.org by January 2010. If you do not have a computer to download the newsletter and would like a paper copy, please contact Kathryn Fenley (see contact information below) and provide her with your mailing address. Please fill out this form to accompany your contribution. All contributions of $50 or more will be acknowledged in writing. The David Sheldrick Wildlife Trust is on Facebook and Twitter.